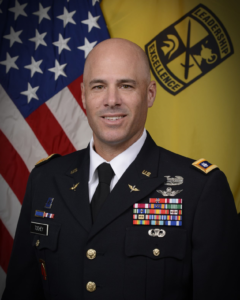 Lieutenant Colonel (LTC) John T. Toohey, from Tampa, Florida, received his commission from Saint Leo University in May 2001. As a Cadet prior to his commissioning, he attended Airborne School at Fort Benning, Georgia. His first assignment was Initial Entry Rotor Wing (IERW) training beginning in August 2001. After graduating from flight school, he was assigned to B/2-25 Aviation Regiment, Schofield Barracks, Hawaii where he served as a Flight Platoon Leader and Assistant Operations Officer. While serving in Hawaii, LTC Toohey deployed to Afghanistan for 13 months in support of Operation Enduring Freedom. Following his Hawaii tour, he attended the Aviation Captain’s Career Course at Fort Rucker, Alabama, before successfully assessing for an assignment with the 160th Special Operations Aviation Regiment (Airborne) in Savannah, GA. LTC Toohey served in the 160th Special Operations Aviation Regiment for 9 years where he held the positions as a Platoon Leader, Company Executive Officer, Headquarters Company Commander, Deputy Operations Officer, Flight Company Commander, and battalion Executive Officer. His service in the 160th included numerous deployments to Iraq, Afghanistan, South America, and other locations across the globe. Following his assignment with the 160th Special Operations Regiment LTC Toohey transitioning to Tampa, FL for an assignment with United States Special Operations Command (USSOCOM) in August 2014. There, he served in the Joint Air Operations Division and as the Executive Officer to the Director of Operations. Following this assignment, LTC Toohey and his family moved to Columbus, OH where he now serves as the Professor of Military Science and Leadership at Ohio State University. Military Education: Airborne Course, Electronic Warfare Officer’s Course, Survival Evasion Resistance Escape Level-C Course, UH-60 Qualification Course, Special Operations Training Course, MH-60L/M Advanced Helicopter Training Courses, Officer Basic Course, Aviation Captain’s Career Course, Army Command and General Staff Officer’s Course, and the Joint and Combined Warfighting School (JPME-II). Awards and Decorations: the Bronze Star Medal with Two Oak Leafs, Defense Meritorious Service Medal, Meritorious Service Medal, the Air Medal with Valor Device, the Air Medal with Numeral Five, the Army Commendation Medal, the Joint Service Accommodation Medal, the Army Achievement Medal with One Oak Leaf, the Afghanistan Campaign Medal with Three Campaign Stars, the Iraq Campaign Medal with Two Campaign Stars, the Global War on Terrorism Expeditionary Medal, the Global War on Terrorism Service Medal, Overseas Service Ribbon with Numeral Two, National Defense Service Medal, Master Aviator Badge, Parachutist Badge, and the Combat Action Badge. Personal: Lieutenant Colonel Toohey is married to Kristy Toohey, from London, Ohio. They have three boys: Cade 12 yrs, Cole 10 yrs, and Grady 8.